← The Bristol Renaissance Faire, real Chicago pizza, and pictures! September seemed very short, very busy and rather disrupted. I had stuff going on nearly every weekend and that’s continuing into October, as well. I’ve long had a routine of getting chores and errands done on Monday and Tuesday, and a lot of creative work done over the weekends because there are fewer distractions. I rarely went out on weekends if I could help it. But that routine has been completely exploded ever since August. It took a while to get re-oriented when I got home, partly because I seemed to be fighting off the con crud that was flattening a lot of other people and didn’t feel well, and partly because I was off routine. The reason I stayed up until 2:30 a.m. the day I got home from Chicago, for example, was because it was a transfer station week and I normally go to the transfer station on Tuesday; I had to get everything cleaned and get the trash and recyclables together so I could go on Wednesday. Plus, I did all the laundry on Wednesday and I normally do it on Monday. Everything was bumped ahead a day or so. I was very busy before Chicon 7 getting Un-Dead TV into ARCs and sent out to pre-pub reviewers, and doing the main edits for Nocturnes in Purgatory and sending them off to the author. City of Promise was released on August 15 and I was querying reviewers and doing follow-up business with that. I got it all done just in time, along with all the prep work I did for my trip and my Chicon 7 panels, one of which I was moderating. I came home to a lot more projects, including page layout and generating the galley proof for Nocturnes in Purgatory because the author sent his edits back in record time. Plus, I wrote and posted a long con report, because I want to be blogging more regularly, and I immediately started ramping up my job and freelance search. Job hunting has proven fruitless, so far–not even acknowledgments that my resume was received in most cases. Freelancing is proving much more productive so it looks like that’s where I’m going to be putting my energy. I’ve been completing my profile on Elance and a new service I discovered via LinkedIn called oDesk. They both do ID verifications: Elance actually calls you on Skype with a webcam, so they can see you on camera and talk to you while comparing your image to the photo ID you uploaded. That was the first time I’ve done something like that and it was kind of funky! But the freelance job I have right now didn’t come from either of those sources. I got it through networking. They say that’s the way people actually get most jobs, traditional or freelance–all the stuff about answering ads and sending out resumes only works about 10% of the time. It’s not my strongest area, but I’m definitely learning to be quicker on the ball when I see an opportunity. The main challenge with oDesk and Elance is the competition: when a job is posted, it’s like you’re a shark in a tank with 500 other sharks and someone just tossed in one piece of chum. But at least it keeps you on your toes! Ten days after I got home from Chicago, my sister and brother-in-law flew out here to spend the weekend working on their brand new waterfront construction: a new boathouse, deck and gazebo, and stairs connecting it all. I went up to help them out, and busted my tail for two days helping apply wood stain to the deck, boathouse and stairs, and take in the paddleboat and power boat for the season. We worked so hard, I’d hoped to go swimming one of the days and never got to! Sunday afternoon, September 16, Dad conducted the very last Townsend band concert of the year, part of a crafts fair and celebration put on by the Historical Society. It went very well, and I recorded it. After the concert, I went straight back to the lake for more staining. My quadriceps were pretty sore from hunkering down for so many hours. I paddled the paddleboat around to its take-in spot on Sunday just before sunset, and I was marveling at how utterly still and clear the water was. I have never seen such a perfect, mirror-like reflection in the water: not a ripple, not the slightest distortion, it was like seeing double. The lake can be very peaceful off-season (except for the fact that someone somewhere seems to be running saws and hammering on something, 365 days of the year!). I was wishing I’d brought my camera with me, but I’m a little wary of taking anything expensive out on the water. My niece’s cell phone is still on the bottom of the lake. The following week, I was getting a church service ready for the Ashby First Parish UU on Sunday, September 23. I needed to make more ritual candles for myself before Mabon, and since I was going to have all the candle-making paraphernalia out for that, I decided to make orange tapers to bless and give out as the “sacrament” for the church service. So, I was making candles all week long, first a shorter mold for the “sacrament” and then longer ones in different colors for my ritual candles. I’m well-stocked for candles now! I didn’t make so many the last time and I decided I wanted to change the colors I was using. I was also busy with the rest of the service: deciding on hymns, finding material for a responsive reading and other components of the service, finding a story for “time for all ages” and writing the sermon. True Mabon (local time) was 11:01 a.m. Saturday, September 22. I did my octaval Tarot reading Friday night and then got up and did ritual for the exact time of the Equinox. The Tarot reading was very interesting, indeed. I’m thinking about it a lot! On Saturday afternoon, I attended a memorial service for a member of the Ashby church, Frank McCarter, who passed away a few weeks earlier from a very aggressive and fast-moving cancer. The memorial service (at the Fitchburg church, which is bigger) was so well-attended, it was SRO–even the church choir loft was full! I didn’t go to the reception afterwards because I knew very few of the people who attended. I went home and finished the sermon for Sunday in a rather sober and thoughtful frame of mind, and I referred to Frank a couple of times during my service. After church service on Sunday, I went up to watch the Patriots game with Dad. This was not fun because the Pats lost the game by one point, in the final seconds of the game, after four agonizing quarters filled with incredibly bad (and frankly, not exactly impartial) calls by the NFL scabs, er, “replacement refs.” I had only just started reading about this issue the previous week and I didn’t get to see the first two games of the season, but I was absolutely appalled by what was going on out on the field during the Pats/Ravens game on the 23rd. I couldn’t believe how out of control the players were, and how incompetent the substitute refs seemed. I started to think that the first three weeks of the season should just be wiped clean and started over! As all alert sports fans know, the very next day the outcome of the Packers/Seahawks game turned on an egregiously incorrect call (a long touchdown pass subsequently nicknamed by some sports writers “the Fail Mary” or “the Inaccurate Reception”), and the NFL finally settled with the regular refs, who were back on duty by Thursday. It’s a relief to have them back, but the whole thing still leaves a bitter aftertaste. On Tuesday, September 25, the weather was so perfect, I went back to the lake in the afternoon to finish a last bit of staining that my sister and brother-in-law couldn’t get done before they had to leave, and helped Dad with a few other things. That week, I was going through the author’s edits for Nocturnes in Purgatory, and getting ready for Full Moon ritual on September 29, which made some very significant aspects to my natal chart, as well as being the Harvest Moon. But mostly, I was working on edits, and on convention preparation. I got my program schedule from Albacon (October 18-21) and made a room reservation–in a budget hotel. I can confess that in public now that the convention room block has sold out. Despite how cheaply I got off with my Chicago trip, I still couldn’t afford two nights at the convention rate at Albacon, and I’ll be staying at the Super-8 two miles away. I’m driving over, so I’ll have a car, and I like the Super-8. I wouldn’t mind a roommate to make things even more economical, if anyone would like to go to Albacon and is on a tight budget! I also followed up on my thoughts of trying out Arisia and/or Boskone again and applied to be a program participant for Arisia 2013. I was accepted, so I guess I’m going! I will probably commute in–it’s about the same commute as I just did to Chicon 7, although with less walking. I probably won’t get much sleep, but I’ll be there! I’m still debating Boskone, but 2013 is Boskone 50 which seems a shame to miss. My Full Moon ritual went fine, but I couldn’t see the moon! All week, I’d been noticing the waxing gibbous moon rising during the afternoons, pale and ghostly in the bright blue sky. It was odd, the way I spotted it and noticed it every single day. But it clouded over and rained all weekend, so we couldn’t see the actual full Harvest Moon at all. On Sunday, September 30, I went up to the lake to watch the Pats game with Dad, and that was a much more enjoyable four hours. The Pats came back from a 7-21 lead by the Bills at the half and basically rubbed Buffalo into the dirt. After seeing the Pats get humiliated in their previous two games, it was most satisfying. The Pats are employing a running game this season to great effect. I’ve never seen them use their running backs so much and it’s pretty impressive! This weekend, I helped out the Ashby church with the Harvest Supper (turkey and all the trimmings) they do in collaboration with the Congregationalist church next door. 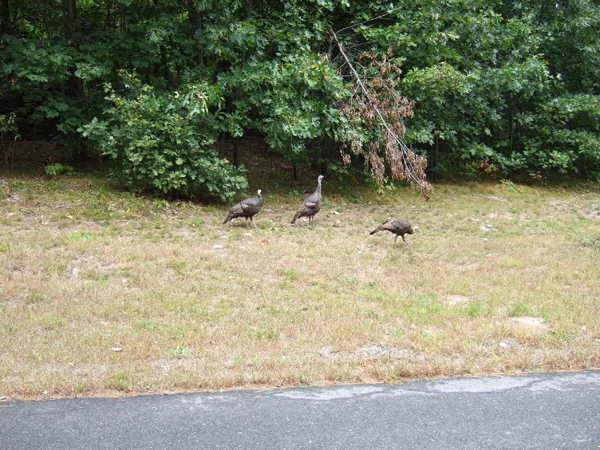 On Thursday, I drove up there to pick up a turkey to roast–the turkeys, tightly sealed in roasting bags, are cooked by volunteers. On Friday evening, I returned the cooked turkey and helped with vegetable peeling and set-up. The supper was Saturday evening, and I went up on Saturday to help with clean-up. So, I’ve had a busy few days, and I missed sunset attunement for three days in a row. Yesterday, I went up to the lake to watch the Pats/Broncos game with dad, and I also cleaned off and covered up the paddleboat, on its trailer, because that needed to be done. Dad and I were very pleased that the Patriots won their game, but I was pretty exhausted by the time I got home. My garden is just about done. It was rather a disappointment this year. The weather alternated too wildly between chilly and extremely hot, dry and too much rain. The pumpkins put out much more foliage and healthier vines than ever before–until they got hit by powdery mildew and squash bugs–but just like the last couple of years, they flowered and flowered but never set a fruit. The zucchini plants didn’t do too well, but produced three zucchini, so at least I got some meals out of them. I started my own tomatoes, seeds I saved from an heirloom variety called “Aussie.” The plants did well, fluffy and healthy with no sign of the late blight that’s plagued my tomatoes for the last three years. But almost none of the tomatoes ripened; I got two (HUGE, but only two) tomatoes that actually ripened on the vines. Deer ate some of the green tomatoes–I know this because I saw tracks–and others fell off during heavy rain or winds. I don’t even have green tomatoes to try and ripen on the windowsill. The carrots didn’t even sprout and the onions disappeared. The only real success this year was my tiny three-row potato patch. 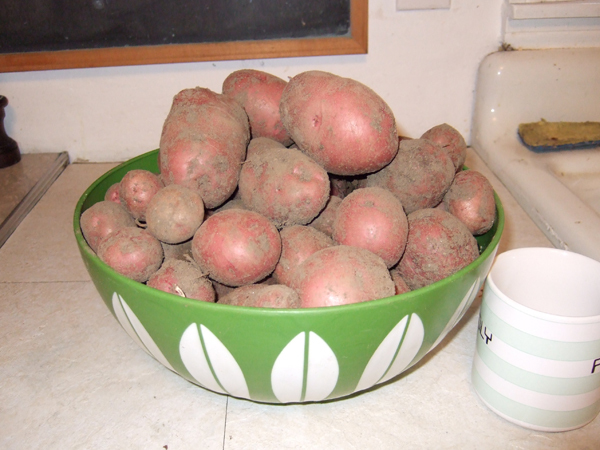 Despite some problems with potato bugs, which I beat back with organic spray, I got nine pounds of potatoes, the best crop ever. I think the plot simply doesn’t get enough sun (as well as too much deer). I’ve saved seeds from a different heirloom tomato variety to try next year and see if it does better. The basil was almost eaten to nothing early in the season, but whatever was eating it disappeared (I have no idea why and I don’t know what it was. Maybe the deer scared it away). The basil plants rallied, and although they’re not nearly as large as the past two years, they’re healthy and fluffy and I’ll have a nice batch of basil to dry for this winter. I just need to be sure I pick them before the first hard frost, which they’re now forecasting for this Friday. It wasn’t just the vegetable garden–the blackberries and black raspberries suffered from the weather, as well, and I didn’t get enough berries for the freezer this year. Of course, the fact that a tree came down in the middle of the blackberry patch over the winter didn’t help, either. Anne’s rose bush and the bee balm did very well, and I saw hummingbirds at the bee balm for the first time this summer. I’ve been taking long walks instead of exercycling since the cooler weather came in, when it wasn’t raining. When I do exercycle, I’ve been watching Season 2 of Sherlock, which is now on Amazon Prime, and the new (and last) season of Fringe has just started. The Tim Burton/Johnny Depp Dark Shadows movie is on Amazon Prime, but it’s a $3.99 rental and I’m waiting for it to go on sale. I’m really enjoying Sherlock. The parodies of well known story titles they ran through in the first season two episode had me just about falling off the exercycle laughing. I’m still wondering how we should take the ending, though–real, or a fantasy by Holmes? Does Holmes have fantasies? Hm. I’m still working on a way to move closer to Dad in Winchendon. I have Zillow alerts up for two different towns and some rather interesting properties have popped up in them. I’ve gotten to the point of driving out to look at the exteriors of a few of them, just to see them in “real life” and get a sense of their location, neighborhood and so on. I have not yet reached the step of contacting a representative for an inside viewing. I need to figure out the financing part before I do that. Some of the places I’ve gone to look at have been scratched off my list when I saw, ahem, why they were so low-priced, or I didn’t like the neighborhood or the extreme proximity to the adjacent houses. But a couple of them…oh, man. Real little gems, unless there’s something I can’t see like termites or a failed septic! That happens to me all the time…but not usually that fast! And a house is a taller order, but you know…it’s how I got this one. Really. And now Arisia wants its panel sign-ups, so I better post this and get some work done. Hope everyone is enjoying their long holiday weekend (Thanksgiving in Canada, Columbus Day here, and a lot of conventions this weekend!)! This entry was posted in conventions, gardening, general life updates and tagged conventions, freelancing, gardening, life updates. Bookmark the permalink.